I work in the public interest and rely on your support! Please donate generously if you find my work valuable! 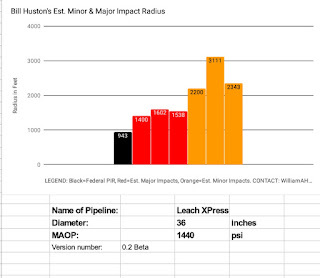 I've been studying the Marshall County, WV explosion of Columbia Pipeline / TransCanada "Leach XPress" pipeline (LXP), on Nixon Ridge, just south of Moundsville WV for the last 4 days. 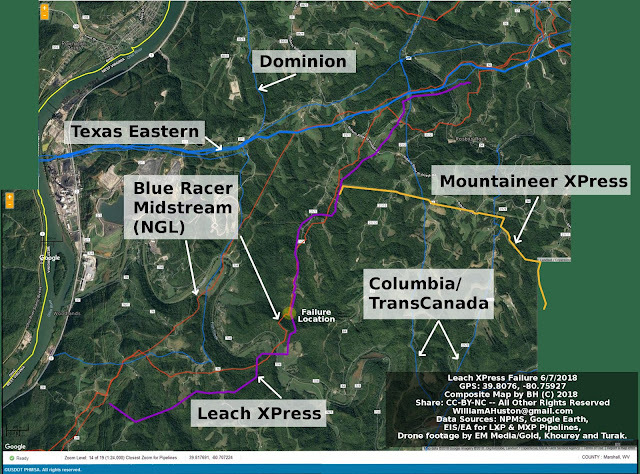 1: In addition to the LXP, which was permitted Jan 2017, and went into service Jan 2018, there is another new pipeline was was recently permitted, the Mountaineer XPress (MXP), with a terminus at Nixon Ridge to the LXP. I believe the MXP is now under construction. 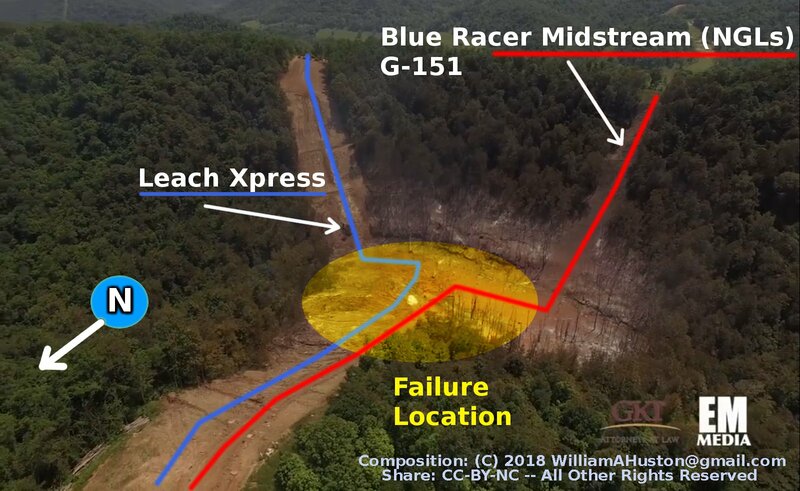 2: The failure of the LXP occurred mere feet from the Blue Racer Midstream Natural Gas Liquids (NGL) pipeline, in the same pipeline Right of Way (ROW). 3: Also, from the published drone shots, it looks like there may have been construction activity in the area? What has frustrated me, is that there is no one single data source to examine. These pipelines are so new (LXP, MXP), they are not yet in NPMS. So I had to assemble these maps painstakingly from various sources: a) NPMS, b) Google Earth, c) the EIS of the LXP/MXP pipelines, and d) published photographs. I am beginning to measure the impact radius, but the failure occurred in a valley, so the blast was constrained on two sides by mountains. So while this may not set any records, it was a BIG fire. UPDATE 6/13/2018: I realize there is an ambiguity in the definition of Potential Impact Radius, as defined by 49 CFR 192.903: Does one measure the radius as a flat 2D projection, viewed from above? Or does one follow the contours of the Earth? It turns out the measurements by each method are very different in a location with a topology like Nixon Ridge/Big Tribble Creek (steep slopes in 2 directions away from the point-of-failure). I have a suspicion this was was "wet gas" (methane mixed with NGLs), but this is just a hunch. The site was near a creek bed, so there could be dampness issues, known to accelerate corrosion. I believe if you examine the pressure profile of gas pipelines, there is greater pressure and stress forces at lower elevations, especially in a valley between two steep hills. This also could result in stresses on welds due to gravity, or due to erosion of the hillside. The Mayflower Arkansas rupture of the Exxon Mobil Pegasus Diluted Bitumen pipeline occurred at such a low point. (I realize Dilbit is a dense, high-gravity product, but methane at pressure does have significant mass, so I think the principle is the same. High velocity mass in a pipeline being asked to turn a sharp corner could equal trouble.) Updated 6/13. Cathodic Protection is intended to reduce the rate of corrosion, but is difficult to get right. Nothing can prevent corrosion, and CP done wrong can accelerate it. This location is suspect for "stray DC"-- known to disrupt CP systems and accelerate corrosion-- due to the presence of a foreign pipeline in the same ROW. (The Blue Racer Midstream). See the two part series by Julie Dermansky in DeSmogBlog   about the Keystone-1 corrosion (also a TransCanada Pipeline) and read the attached reports. Updated 6/13. Was there an "External strike" due to construction equipment? The drone footage shows one bulldozer at the top of Nixon Ridge north of Big Tribble Creek. 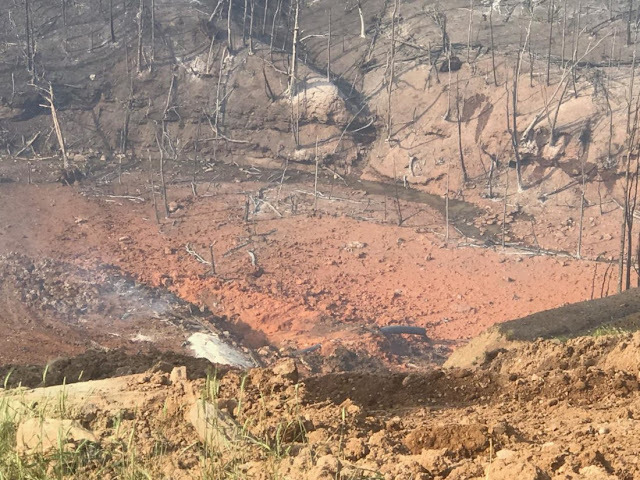 And there appears to be another dozer which looks to have slid down the south hill (Fish Creek area), and appears to have been involved in the fire. Was there construction activity, perhaps erosion control, prior to the explosion? Corrosive Product? -- We need to find what the source of this gas is, and the composition. As I have stated, for several reasons, I suspect this was wet gas. (1: wet gas region, 2: size and shape of the fire, 3: statements made by TransCanada). Wet gas is known to be potentially corrosive. There are many online documents about this. Such as [this]. It is possible that any fracked gas, may contain corrosive components from the flowback fluids (brines, bacteria, H2S, CO2, etc). Were there Defective Welds or bad inspections or quality control? Was there Operator Error which contributed, such as block valves closed remotely in error? Was there Mechanical Failure, such as with the SCADA system, or related remote sensors? Multi-Phase product? If it is wet gas, then special problems in multi-phase pipelines should be looked at. There is a sharp turn at the point of failure, and it is at a low point. Can slugs damage a pipeline at a sharp corner? Slugs can accumulate at a low point and cause pressure surges. Proximity to Upstream Compressor? I believe the direction of flow is generally South and West, so the compressor would be the Lone Oak, which I estimate now to be ~16 miles away? Updated 6/13. HELP! I CANNOT FIND THE Maximum Allowable Operating Pressure (MAOP) anywhere in the FEIS!! Man, how irresponsible can you get!!! 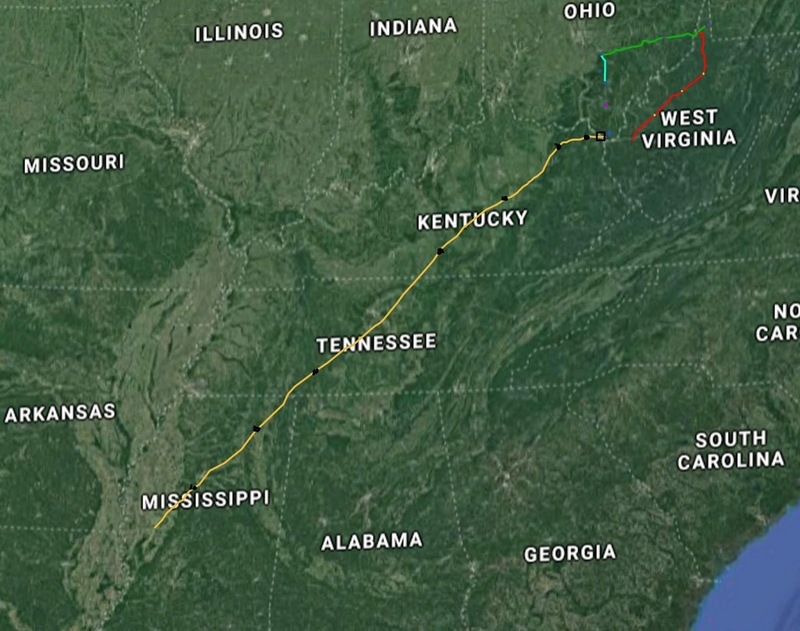 UPDATE 6/13: Carolyn Elefant, an attorney who works with communities fighting pipelines, and a former staff atty at FERC wrote to me, "the MAOP would be in the Exhibit G flow diagrams which are typically CEII information. Possibly also in some of the initial resource reports." Yes, I know I've seen it sometimes in the description of the project. I think FERC should REQUIRE the MAOP to be made public IN ALL CASES. For 1440 psi and a 36" pipe, the PIR from the federal formula is 943 ft. Since this is *Potential* Impact Radius, the actual value should never exceed this (but always does from my research). My formula predicts 1602 ft for what I call the Major Impact Radius. (The max of 1490, 1538, & 1602). According to my initial measurement (Google Maps/Earth), the Major Impact Radius (scorched trees) is ~1,200 ft. Notice this is above the federal PIR (bad!) yet under mine (good!). Note that there were likely minor impacts far beyond this, up to 3111 ft away according to my formula, but being a remote area it would be impossible to know. (I usually use warped or melted home siding as an indicator here. ) Also the unique terrain (occurred at the bottom of a steep valley) may have constrained the impacts. This is one of the first accidents which I've got data for after I built my model. (I had to do some tweaks after Salem, because there was good quality data, and it was very bad... Minor impacts out to 2,200 ft! But this one helps to confirm my model is a good one, at least up to 36"in pipelines. The Leach XPress (LXP / green) is part of several new related projects built or proposed by Transcanada, including the Mountaineer Xpress (MXP / red), and the Gulf Xpress and the Rayne XPress and the Gulf XPress (both yellow). Based on a still from a drone shot posted by Marshall County OEM, I used Google Earth to locate the exact spot of the failure. I named this "Marshall County Suspect Location", even though it was on Big Tribble Creek, and reports had only mentioned that it was near Fish Creek. Compare this from the still of the drone video posted by WTRF-News7 at the top of this article. Bill -- how do you suspect the ruptured pipe ignited?